With the approach of Winter, longer nights, and cooler temps, my mind turns to warm and elegant desserts. 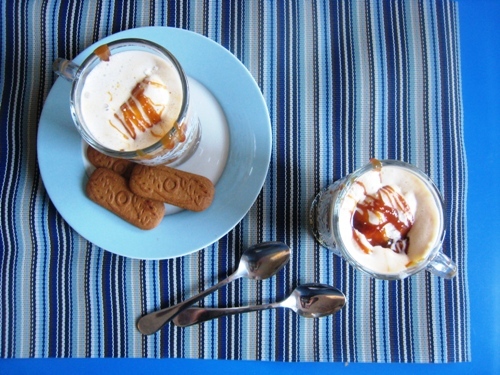 What sounds more elegant than serving Salted Caramel Affogatos? Affogato is just a fancy word for coffee float. A traditionally Italian version would, of course, feature gelato, but regular ice cream can work just as well. The better quality ice cream, though, the better your treat. Tradition would also dictate that you use espresso. But, in the absence of an espresso machine, feel free to use strongly brewed coffee. Always the skeptic when I experiment in the kitchen, hubs raised an eyebrow when I began to assemble these. But once he saw the finished product, he was a believer. Oh yes, yes, he was. 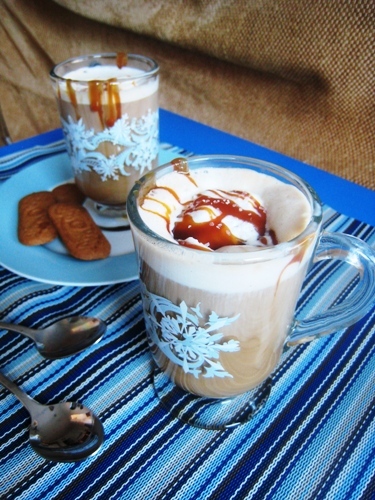 This dessert coffee is so incredibly easy, you will shock and amaze everyone who sits round your table this winter. Serve them with a few cookies or biscotti for an elegantly sweet ending to a meal. Divide the coffee into two large mugs. Place one scoop of gelato into each mug. 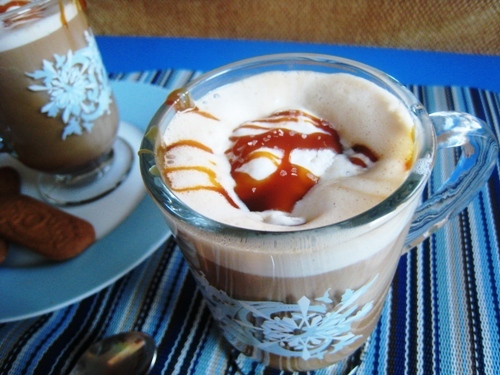 Drizzle the caramel sauce over the creamy foam that forms. Sprinkle each with a pinch of salt. Thanksgiving-themed What’s On Your Plate: Next week on November 16th, we’ll be sharing our Thanksgiving Menus! If you don’t have one decided by that time, you can be inspired by what others share. Thank you for hosting! Even this early there are several good recipes so far. This week I shared my cinnamon raisin bread. I love the photos and the recipe! I do not even like coffee…but you made it look delicious in the photos. That is pure talent! I know. How easy is that?! Thanks for hosting Jessica! Hope you are having a great week! I can’t wait to try the coffee floats! They look so good (and easy)! Just one question…Is the coffee or espresso hot? Wow does that sound great. So easy too! I really really want to come eat at your house. O.M.Goodness! This sounds DELICIOUS. It is so simple and brilliant. I just had to pin the idea on Pinterest. Thanks for sharing. As a family working on a Dave Ramsey Debt Snowball I absolutely adore your blog. You go, girl, on that snowball. You can do it. Hang in there when it gets tough. Thanks for your kind words!